Having a hard time to tune and adjust the pitch of your guitar instrument before you showcase your music talent? Forget about seeking help from friends or spending hours to tune string by string. 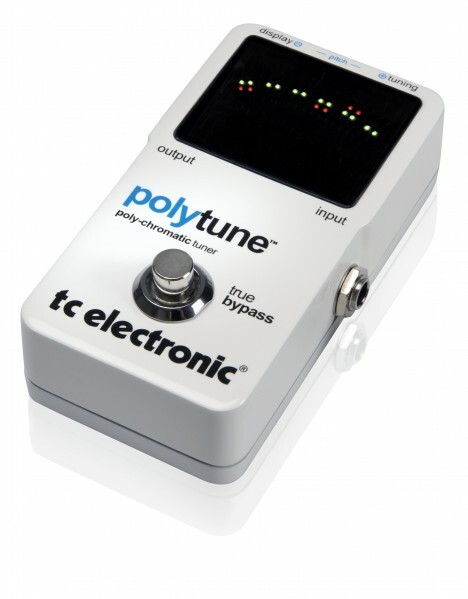 Poly Tune by TC Electronic introduces to guitar lovers a fast, easy and revolutionary way to tune their guitar. Dubbed the world’s first polyphonic guitar tuner, the cutting-edge tuning technology product, Poly Tune, allows users to tune all strings simultaneously. This stomp-box sized guitar tuner is able to achieve an amazing +/- 0.5 cent accuracy. This tuning device includes a standard needle mode, two chromatic modes, a real-time stream mode that shows users the pitch changes as they happen. Users can store and keep their favorite setting in the built-in memory. Users also can make use of the true bypass feature to keep their own setting. The true bypass function allows for your carefully sculpted tone to flow unaffected when the pedal is bypassed and for silent tuning once engaged.